The Clockenflap Music & Arts Festival returns for its 11th edition from 09-11 November 2018 at Central Harbourfront, bringing together a sparkling array of talent, unique attractions and music-loving fans that all adds up to the best weekend of the year. 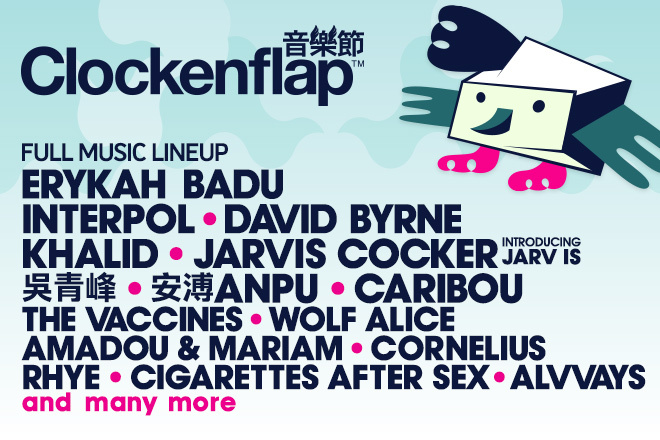 The only official Clockenflap ticket selling channel in Hong Kong and worldwide is Ticketflap (www.ticketflap.com). We highly encourage fans to only use this official channel to purchase tickets. Tickets bought via unauthorised sellers or from someone you do not know may ultimately be fraudulent and will not work on the door. Do not risk it, as there is nothing we or Ticketflap can do if you do not buy from the official source. All ticket types are available for the specified period and/or while stocks last. Student ticket holders are required to present valid Hong Kong full-time student ID at the festival entrance to gain entry.